From bartending to blogging, here are some of the best ways to make money while travelling the world! 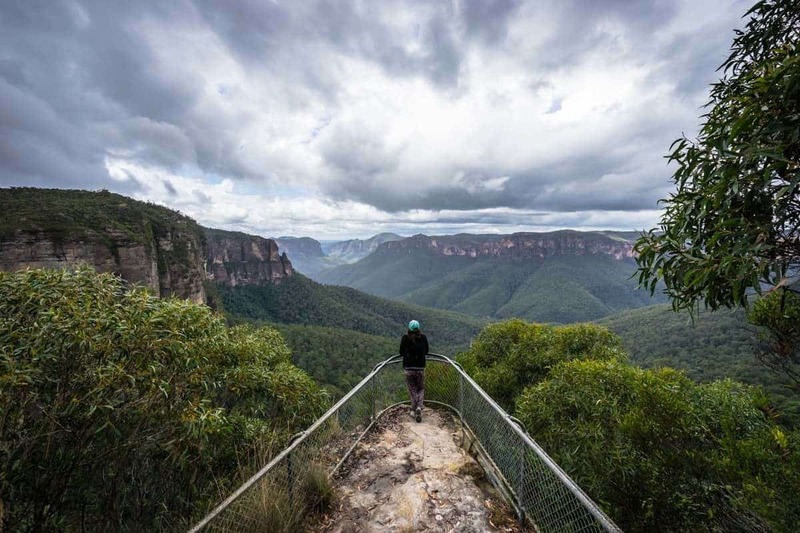 It was 2005 for Alesha, and 2007 for me – those were the years when we first left Australia on our own, with one-way tickets to foreign lands and few thousand dollars in our bank accounts. The plan was simple: Go travelling, pick up jobs for a while so we didn’t end up broke, and go back home when we grew tired of living a life overseas. The plan backfired. From the very first day we both realised that travelling the world was something we wanted to do for as long as possible. 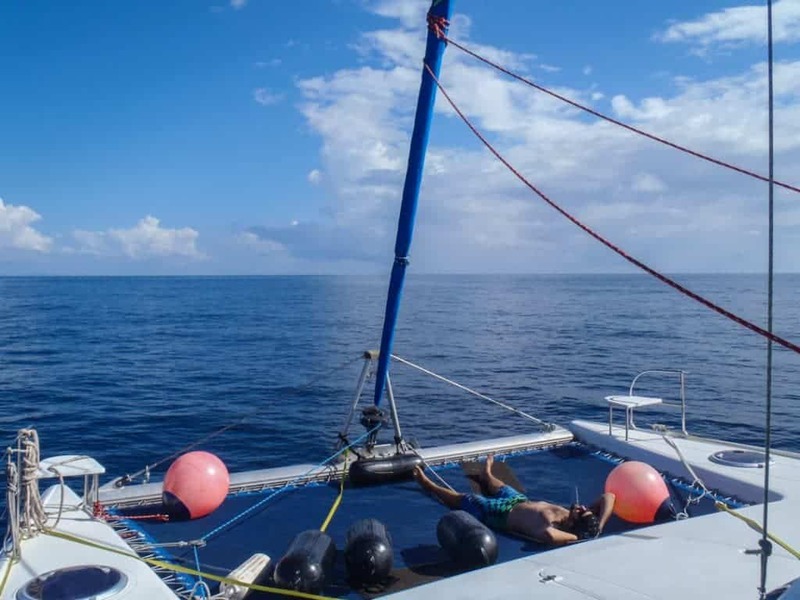 The idea of living a life on the road indefinitely is considered a dream for many people, but the truth is that unless you’ve won the lottery or received a large inheritance, it’s quite difficult to fund this lifestyle indefinitely. There are a huge number of jobs out there that allow you to live a life of freedom and essentially choose where you want your office to be every day. Gone are the days of working the same old job just so you can enjoy a couple of weeks of holiday a year. Now you can turn your life into an adventure, depending on your perspective! Like most long-term travellers we didn’t have high-paying corporate jobs to quit, $100’000 in the bank or a house and a bunch of stuff to sell before we left home. We just saved some cash, got a few things and threw them in a backpack, and headed off in search of life experiences. We never went to college or university. When we both graduated high school we picked up entry-level, blue-collar jobs, lived with our parents, saved some money and headed off overseas on one-way tickets. Over 9 years later, we’re still travelling, so you can probably do it as well if you’re in the right situation and have the motivation. We’ve worked in a whole range of different jobs to stay on the road, from cleaning hostels to being a tour leader to bartending to construction to packing parachutes at a skydiving centre to working at a summer camp to finally running a successful travel blog and business. There’s really no limit to what you can do if you open up your imagination! One of the most common questions we get asked is how to make money while travelling the world, so we’ve put together this great guide to give you the ideas and inspiration to start turning your life into an adventure! The first thing you need to realise is that a lot of jobs that allow you to travel the world require you take some courses, get appropriate visas, save some money first or have a particular skill set. But don’t let that deter you! If you’re not looking at going down a professional route such as consulting, then there are plenty of other things you can do. Here are just a few different ways to make money travelling the world. The first thing you’ll have to do is save some money. Not a lot, but enough to help you survive when you land in a new country. Because honestly, it could take you a few weeks to find a job. Figure out what kind of jobs you would like to do overseas. Are you interested in teaching English or working on sailboats? Do you want to start a travel blog and try to make money from that? If you already have an idea of what you want to do then it will make things a bit easier. This is also important to consider for visas. Sometimes you don’t have to research how to make money while travelling the world. Sometimes the best thing to do is just go travelling and see what jobs you end up with! That’s what we did most of the time and it worked out fine for us. Potentially the most expensive part of this whole experience. You’ll need to start travelling, and to do that you need to go somewhere. But don’t worry, this is also the most exciting part of the whole thing! If a cool opportunity comes your way, then make sure you’re open to take it! You can’t plan for every single job that may or may not fall in your lap. And occasionally it’s when you are at your lowest and when you’re least expecting it that an epic travel job comes your way! We never expected to be working on a yacht in the Caribbean, but that’s what happened by just being in the right place at the right time. Be prepared to say yes to whatever happens. If you start travelling and don’t end up with a job or find a way of earning money, don’t worry about it. These things happen. It doesn’t mean you failed, it just means things didn’t work out this time around. If you have to go home so be it. Just save your money and start again. However we strongly believe that almost everyone should be able to find a job to stay on the road. One of the most popular ways for many people to move overseas and earn an income is to teach English as a foreign language (TEFL). We’ll be honest, we didn’t even know this was a thing for the first few years we were on the road, but now we can’t believe just how many of our friends around the work and live in incredible places by teaching English. Asia is a great place to get into this industry, as there are thousands of schools crying out for teachers. Especially in countries like Thailand, Vietnam, China and South Korea, it can be real easy to secure a job if you know where to look. Latin America is another hotspot for it! It’s a great lifestyle too! You work anywhere between 10-40 hours a week, earn a decent salary (higher in places like China and South Korea), sometimes your accommodation is covered, and you get ample holiday time to go travelling around the region. So what does it take to become an English teacher? Well first of all you need to be able to speak excellent English. If that sounds like you, you’re halfway there! Second you need to get a proper certification. There are many ways you can get one, such as studying in a four-week course in the country you want to work in. But we actually recommend doing it online with MyTEFL, as you can actually get your certification before you leave home. Another cool thing is that once you are qualified and have experience, you can teach English over Skype. We met a couple in Lago de Atitlan in Guatemala who would tutor students from around the world for only 4 hours a day, 4 days a week. The rest of the time they would just hang out, go kayaking and hiking and practice their own Spanish. What an awesome life! 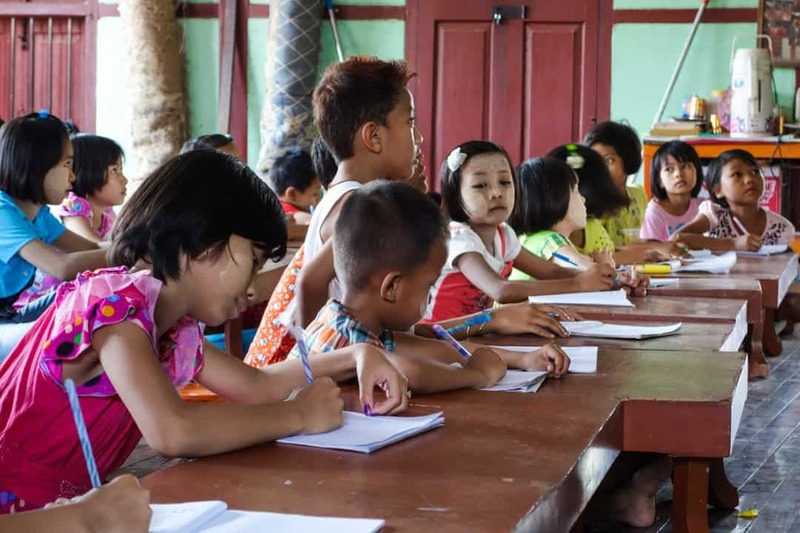 Learn more about the MyTEFL program and structure. Some of the kids we taught English in Mandalay, Myanmar. If you’ve ever stayed in a hostel before, you know just how fun they can be! Transient backpackers coming through, excited about life, constantly looking for a party or good time and just spreading good vibes. Now imagine being in the middle of that scene, living the travelling the dream! That’s what hostel life is like. Working in a hostel is one of the funnest travel jobs you can have. All the staff become like your family, the hostel starts to feel like your home and you are forever meeting awesome travellers! We have both worked in hostels around the world and loved every minute of it. The jobs you can get working in a hostel are quite varied, but the most popular ones are working reception, working in hostel bars, being a tour guide or activities coordinator (Jazza’s old job). In North America and Europe you might also be able to clean rooms, which isn’t actually as bad as it sounds when you’ve got a cool crew around you. 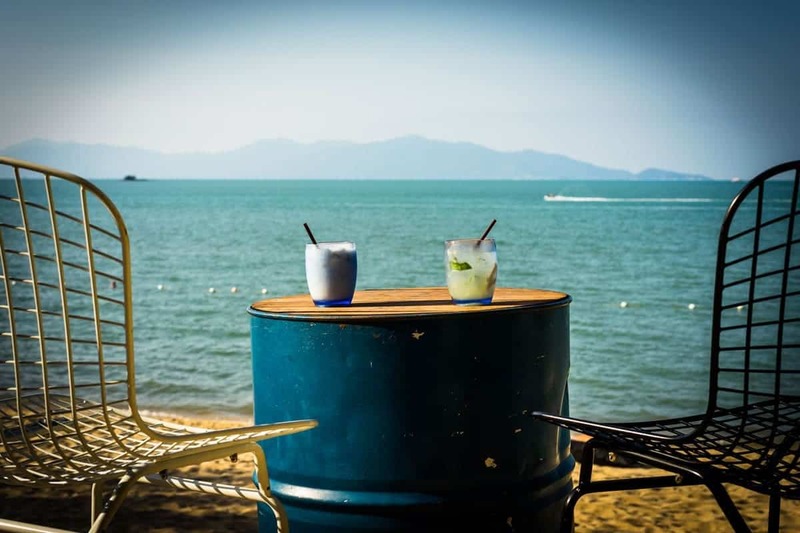 To get into this the best thing to do is simply stay at cool hostels around the place and keep an eye out for any that are hiring. Have a good personality, talk to the staff, meet the managers and drop off your CV. You’ll never know where it could lead to. If you want to get into managing a hostel, our friends at Mad Monkey Hostels in Southeast Asia run a phenomenal 12-week Hostel Management Course. Besides being the most successful hostel chain in Asia, with world class training, they also focus on social enterprises and charity work. Highly recommended! “How to find a job in a hostel” on Hostelworld. Working in a hostel is one of the coolest travel jobs you can do! If you’ve got an outgoing personality and a passion for travel then perhaps being a tour guide will be right up your alley! Jarryd worked as a tour guide in Canada and Vietnam and absolutely loved his jobs! The life of a tour guide can be quite varied. Your first thought might be that it entails multi-week bus tours, leading a group of young backpackers around amazing places a-la-Contiki or Dragoman style, and this is definitely an option if you are into that. But you can also be a tour guide for day trips, walking city tours, adventure activities and a whole lot more. To become a tour guide doesn’t require taking a course, but having experience in what field you want to be a guide in definitely helps. Want to lead walking tours in Madrid? Brush up on your Spanish history (and spend some time in the city first). Keen on being a year-round travelling tour guide? Expect a long orientation and interview process before you get the job. It’s also possible to get tour guide jobs through hostels. “How To Be A Tour Guide” on National Geographic. 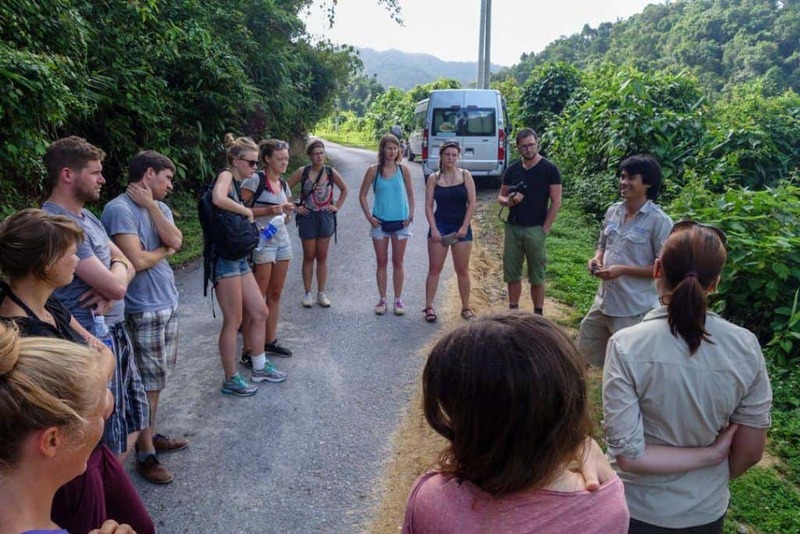 “Be An Adventure Tour Guide” on Transitions Abroad. Even if you’ve never been on a cruise ship before, you probably know what’s involved: Sailing the seas in luxury. But to give the best service to their passengers, cruise ships need crew, and a lot of them! Working on a cruise ship is an amazing travel job that can, literally, take you all around the world! And the best part is that there’s such a huge variety of jobs required on board that almost anyone with a great hospitality attitude and a sense of adventure can look into it. Housekeeping is a common entry-level job, as is waitressing. If you’ve got a very specific performance skill, such as a musician or dancer, you can always look at going down that route too. More mechanically minded and hands-on? Look at maintenance or engineering. The big benefit of working on a cruise ship is that you travel non-stop, and there is very little for you to spend your salary on the ship, so you can save a lot of money (food and accommodation is included). Keep in mind though that is a lot of work, and while the guests are out exploring tropical islands the crew are usually onboard doing their tasks. But it’s an amazing way to make money while travelling the world! “Work On A Cruise Ship” ebook by the legendary Wandering Earl. 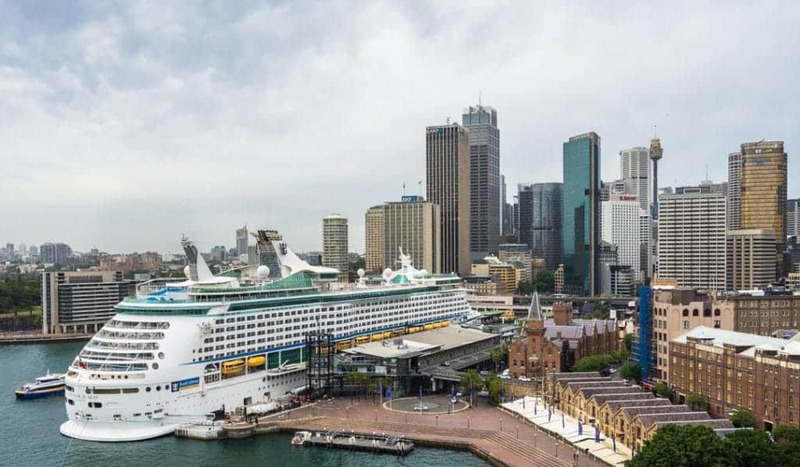 A cruise ship in Sydney Harbour – Oh the places you’ll go! There is one job that is kind of in the same line of work as cruise ships, but far more luxurious and difficult to get into – working on a super yacht. Strictly reserved for the rich and famous, super yachts are floating 6-star resorts that are privately owned. The number of passengers is far lower than that of a cruise ship, but the ratio for staff is higher. Often 1:1, or more! Working on a super yacht is very exhausting work, as the quality of service that must be delivered is impeccable. It’s also much harder to break into as you need quite a few certificates before you can start applying for jobs. But depending on the super yacht you get on, it can be the best job in the world! We’ve got a lot of friends who have worked on super yachts, and their experiences range from the most amazing times in the world to being absolutely horrible. The owner of the yacht really does make a difference. But the people who get on good ships – wow! Hanging out with A-list celebrities, sailing through the most beautiful islands in the world, getting a rare insight into a world of luxury that very few ever see, all while getting paid very good money to do it! Working hard on a yacht in the Caribbean. 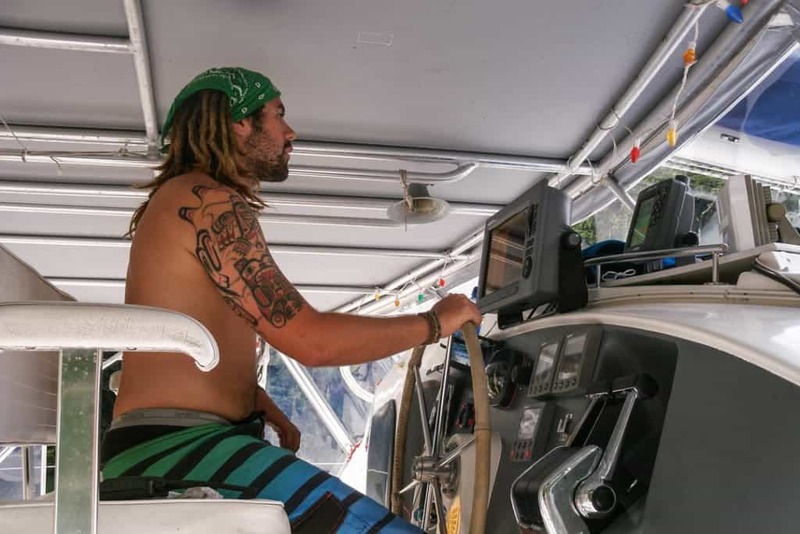 Bonus Tip – Way back during our travels in Central America we spent a few months crewing on a 43-foot catamaran owned by a very cool Australian couple. While this definitely wasn’t a super yacht, it was one of the most unique and coolest experiences of our travels. Jarryd worked as a deckhand and Alesha as the cook, but essentially we just hung out a lot, fished, drank rum and had a good time! If this sounds more like you’re kind of thing, check out the website Find-A-Crew. We didn’t use it (we met the ship’s owner in a bar in Guatemala, hit it off, and he invited us to join his tiny team), but we know lots of people who have. The work isn’t always paid, but usually you have your expenses covered and it makes for a great way to travel between amazing islands and destinations. “Get A Job On A Super Yacht” – an excellent resource page for this kind of work. Find-A-Crew – an amazing website that connects ship owners with willing workers. 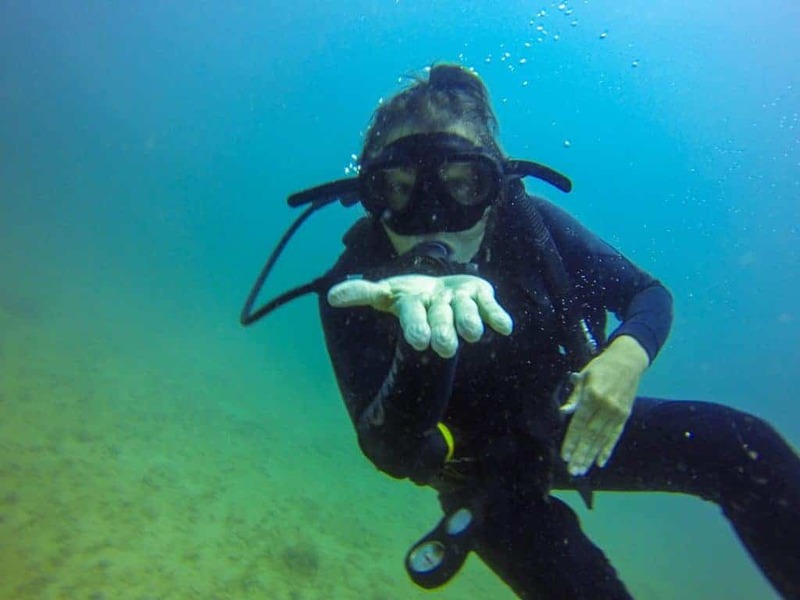 Scuba diving is one of the most amazing things you can ever do! From the very first moment we tried it in Honduras we instantly became hooked, and have made it a goal to try and dive as much as possible. What we couldn’t believe when we first got certified though was the huge amount of travellers who were “living the dream” by working as Divemasters and Instructors in paradise! Getting paid to do the thing you love the most is a special thing, and there are thousands of people around the world doing just that! If you love scuba diving you can work your way through the various certifications to start becoming a professional and get paid to dive. A Divemaster is the first professional level, and with more time and experience you can become a coveted instructor. This isn’t a job that you will get rich doing, but it does allow you to live by the ocean all over the world and make enough money to have a good time, all while diving every single day. 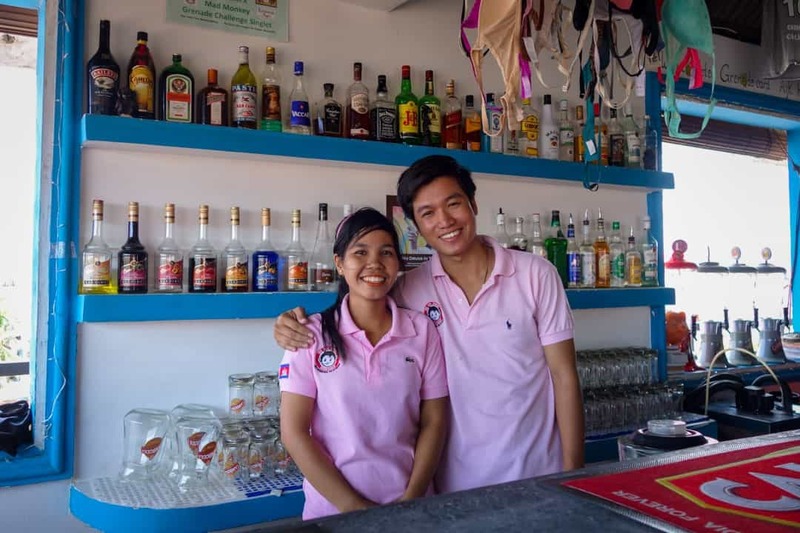 A lot of big dive shops in places like Thailand, Honduras and Egypt take on interns and divemasters-in-training, so you can even get work in exchange for your certifications when you’re just starting out! 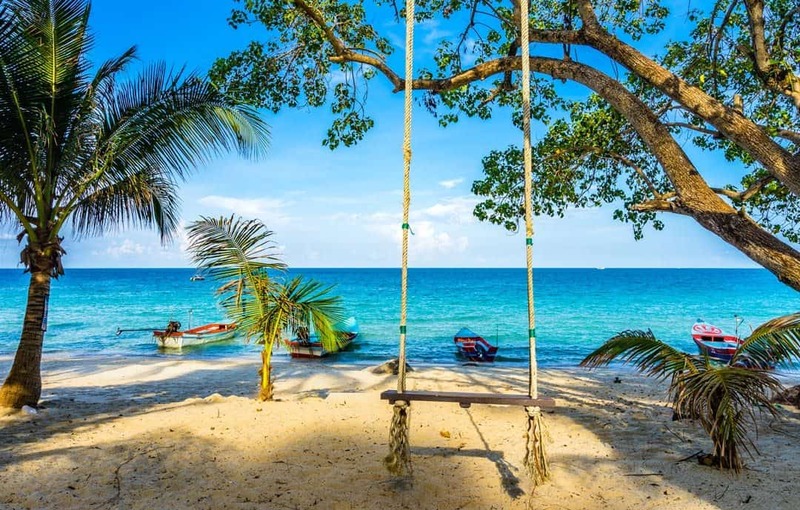 How To Become A Divemaster In Thailand – Bella, one of our amazing writers, gets in-depth on how to break into the professional scuba diving world in one of the most beautiful countries ever, Thailand! Lesh diving in Vietnam. An amazing way to make money travelling the world, if you love the ocean. Alesha’s first overseas job was working at a summer camp in California, and it was one of the best times of her life. Basically you work as a camp counsellor, looking after kids who are on their summer break. Being a camp counsellor is part babysitter, part big sibling, part teacher, and a whole lot of fun! The roles can vary depending on which camp you go to and what your skills are. Alesha was in charge of motorsports and outdoor activities, so she would look after the kids while they drove go karts, played on obstacle courses and generally had a merry old time. It helps to be good with kids for this kind of job, but what really makes it are your fellow counsellors who will become like family. 10 years later and Alesha is still in touch with many of her fellow workmates. Camp Leaders – get a job working at a summer camp in the USA. CC USA – another great resource. Alesha in charge of the high ropes course while working at Summer Camp in California in 2006. Of all the amazing jobs we’ve had around the world, this one may just be Jazza’s favourite. 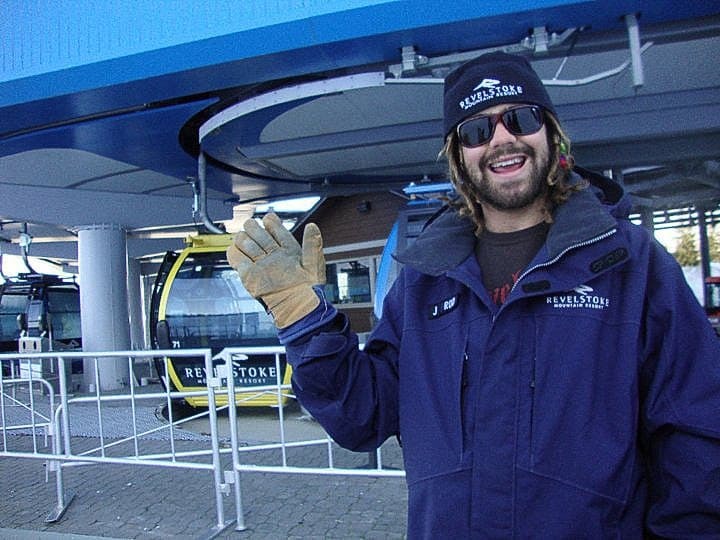 For 3 winter seasons we worked at different ski resorts in Canada, and our lives were pretty damn epic. Jazza worked as a lift operator (lifty), being in charge of the ski lifts and helping passengers get to the top of the mountain, while Alesha worked in hospitality in bars and cafeterias, and also worked half a season as a lifty. These jobs are often low-paying, but high in experiences! Working at a ski resort is really the absolute best job you can have if you are into snowboarding or skiing. Even on our work days, we would still get up to 10 laps in on the hill. Everyone is amped on life and stoked to be shredding, so the atmosphere with all the workers is incredible. In addition to this you’d be surprised just how cheap it can be to live in a place like Canada! In fact what we would spend in 4-5 months of living at a ski resort would be about the same as going on a 2-3 week ski holiday! That’s because you end up getting cheap accommodation, have your lift pass included as part of your job, you cook at home instead of eating out every meal and you’re just damn tired from shredding so hard every day! All of this while actually getting paid as well. Whenever we meet someone who is at a loss about whether or not they should travel, we always tell them the same thing – get a job at a ski resort! Interesting piece on the highs and lows of working at a ski resort. SWAP – a program designed to help people get a job at a ski resort in Canada before they leave home. Jazza working as a liftie in Canada. One of the easiest jobs to get when you’re travelling is working in hospitality. This could mean working in bars, restaurants or cafes, providing services to paying customers. Sometimes getting a job pouring beers could be the best way to make money while travelling! Or even working as a waiter or waitress. If you don’t think that you’ve got the personality to be at the front of house, why not work as a chef or washing dishes? We’ve both worked these kinds of jobs on the road, and to be honest it was a mixture of love and hate, depending on where we were and what kind of place we were working in. For example Jarryd once worked in the most high-end bar in Montreal, dealing with B-list celebrities and very rich customers. He absolutely hated it (but the money was good). I had a job working in a resort in Canada, serving drinks by the pool and it was awesome! GoAbroad Hospitality Jobs – a good resource, but seriously the best thing to do is just be in the place you want to work and find something then and there. Not all ways to make money travelling the world involve having an office or working in a physical location. One of the most popular ways to travel and earn an income at the same time is to work online. There are literally thousands of jobs you can do online, and they range from things that require a very specific skill set, right through to general jobs that anybody can learn and implement. The great thing about working online as well is that you can often be your own boss, make your own hours and be completely location independent. What does this mean? Well it means you can travel anywhere you want, whenever you want (as long as you can find an internet connection). Working online means you get to move your office to wherever there is internet. Like Cappadocia, Turkey. But you can’t pick your officemates. See this website you are on right now? Well this website and brand is how we make a living. Yep, we quite literally earn money while travelling the world by running NOMADasaurus. But how does it work? There are a whole bunch of different ways to earn money from a travel blog. Some of it is obvious, and others are hidden behind the scenes. For example companies will pay us to promote them on this website or on our social media channels. This is obvious advertising. Other times tourism boards, hotels and tour companies will pay us to go to their destination and write about it. Another way is that brands will pay us for our photography. Less obvious ways are through things like affiliate sales. For example if we recommend a product and you, the reader, buys that product using our link we make a small commission. The brand pays us this commission, so it doesn’t actually cost you anything extra. Now it does seem like being a travel blogger is the dream job. Travel the world, get paid to put a few photos in Instagram, have a company send us to exotic locations and all we have to do is write a blog post about it. The truth is that this is extremely hard work, and sometimes we work 10-12 hours a day. But the rewards are definitely worth it. It also takes a long time to build up a travel blog to be successful. It very, very rarely happens overnight. So if this is something you are thinking about getting into just keep in mind that it can and will take a lot of work. Personally we recommend people to travel the world a bit first before starting a blog. This way you can experience things from a clear perspective, instead of always thinking about social media, taking photos, writing articles etc. If you have any other questions about starting a travel blog drop us an email. How To Start A Travel Blog – Our own personal step-by-step guide to making a travel blog in less than an hour for under $50, even with no prior experience. Getting paid to be at the Colours of Ostrava music festival in Czech Republic. Not a bad job! If you’ve got a skill that involves a computer, then you can pick up work around the world by freelancing. The list of jobs is almost endless and the pay can vary from being quite low to enormous! If you’re into graphic design, web development, photography, videography, writing, SEO, marketing or just about anything else you can think of, chances are you can hire your skills out from anywhere in the world. Can you speak two languages? Work as a translator. For example, Jazza works as a freelance travel writer for major media publications, in addition to writing on this blog. So what this means is we travel around the world, then sell our stories to outlets. The same thing can be done with video and photography. For another example we have an assistant who works for us while she travels. Same with our web developer. We have a friend who makes apps. He basically gets a 3-month contract, settles down somewhere for that time to work, then when he’s finished he has usually made enough money to travel for at least 6 months. These kind of jobs can be as varied as your imagination. All you need to get into freelancing is a passion, skill and internet connection. Even if you’re not an expert web designer you can still find random jobs that people would like done. Upwork – great for professional jobs. Fiverr – offer an entire range of services. 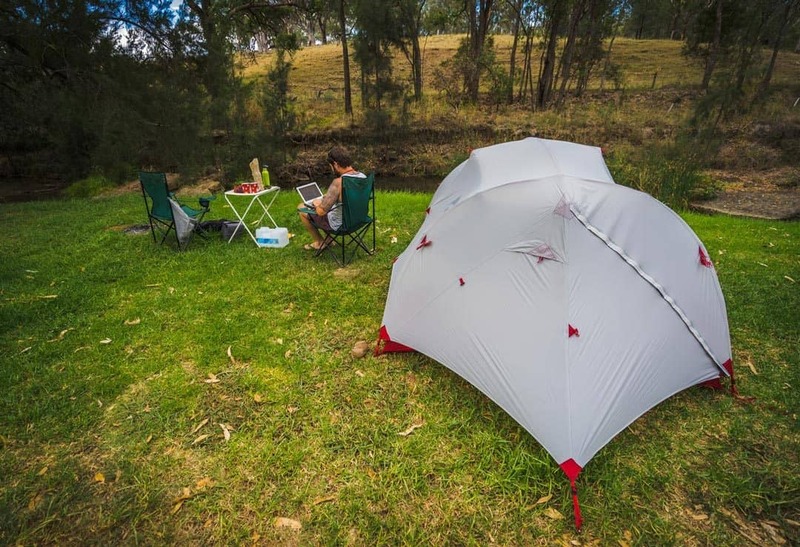 Writing a freelance article while camping in Australia. 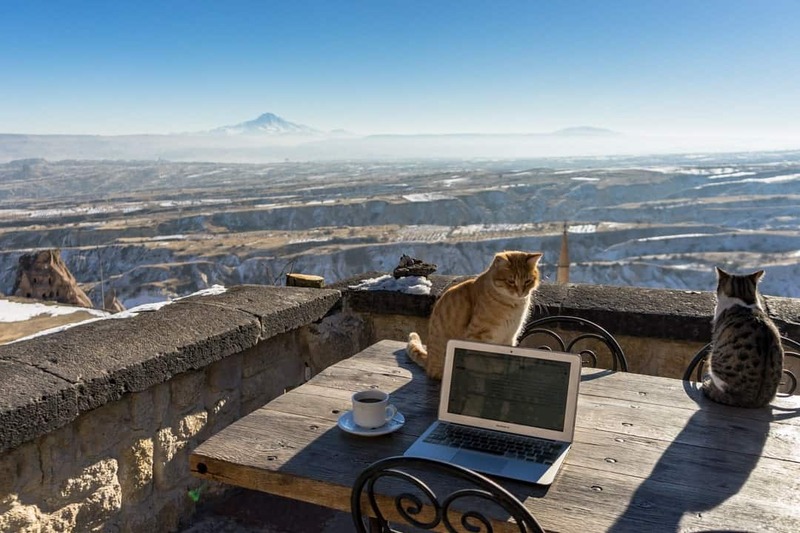 Depending on what you do back home, you might be able to convince your boss to let you work remotely! If you’ve got the kind of job that is primarily based on a computer and doesn’t actually require you to physically be there (for example you don’t need to meet with clients in person or visit worksites) then why not try and move your office to the other side of the world? This is easier said than done, because not all companies are in a position or have the infrastructure to allow their employees to work remotely, but it doesn’t hurt to look into it. One way of figuring it out is this – Could you do your job from home? If so, then you could probably do it from your home in Thailand as well. 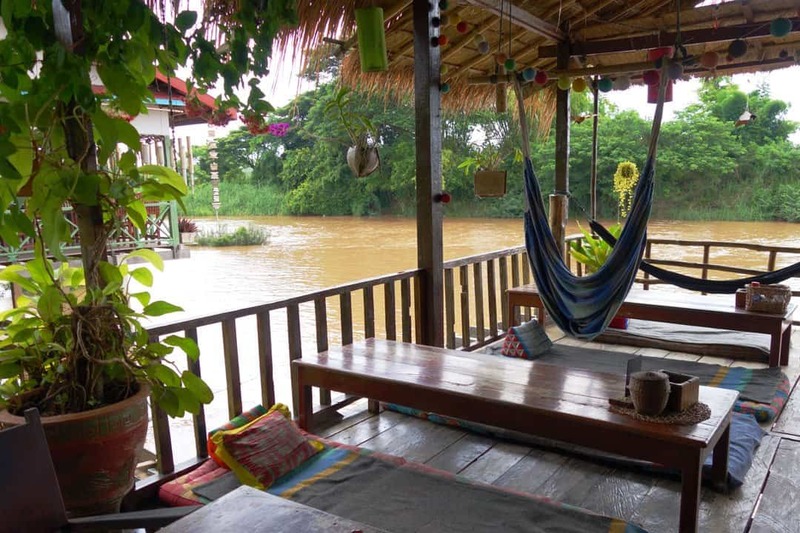 Our old, temporary office on the Mekong River. Don Det, Laos. And that’s our list of some of the best ways to make money while travelling the world! Keep in mind that this is by no means a comprehensive list. There are hundreds of jobs that you can do while travelling. Flight attendant, musician, artist, online marketing, virtual assistant, construction, packing parachutes at a skydiving centre (one of Jazza’s old jobs). It’s almost endless! Our biggest advice is to just get out there and make life an adventure! Don’t think about it too much and don’t stress about whether or not you’ll find a job. It’s all part of life’s journey. Embrace it! So get some money in your savings account, downsize your life, sell your possessions and buy a one-way ticket to anywhere! Have you ever had a travel job? Tell us how you make money while travelling the world! We have heard of this til recently. Our friend in Argentina got his iPhone through this way. Apple products are not available in Argentina. Thank you for sharing James. I think doing online jobs is mostly appropriate for travelers. I run a travel blog and it helps me a lot on making some extra money. Thank you for your information and blog. I am thinking of doing Wwoofing next year to South Korea. Love to know more about how to make an income overseas. That would be a great adventure. Have you seen our article on wwoofing in South Korea? Have a great time and happy travels. Thanks for sharing it. I’ve got informed a lot. If your first language is english or you are fluent at it, teaching eglish might be the easiest way to get a job. Which is for me not the case though. Anyway great tips! Hope you guys all the best. Thank you so much Arava. Sounds great. Thanks for hearing. I just got done teaching English for two months in Guatemala City! I took a TEFL course in Antigua and then moved here. Teaching English seems like one of the best ways to travel. I taught for 3 hours a day, 5 days a week and made more than enough to live comfortably! I hope that I will be able to continue doing something similar in 2017! Thanks for the post guys! Thank you so much Thomas. That sounds great. We have never taught English but would like to one day. A lot of friends have and are still doing it now. We wish all the best for 2017 and hope you get to teach more.